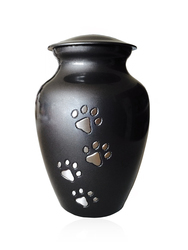 At Territory Memorials, we custom make a variety of pet memorials to celebrate the life of your cherished family companion. A memorial in your yard is a symbolic way to process grief and maintain a feeling of constant connection to your beloved animal. We recently bid farewell to our beautiful English Staffy Mica, who was in our family for over 12 years. His calm and faithful presence is missed every day and we love the memorial we have for him in our back yard. Various sized granite lawn markers with your pets name skillfully engraved. Options include attaching a weather proof ceramic photo or graphic image such as a paw print. Various sized granite lawn markers with bronze plaque attached, available in various colours with images. Bronze plaques with a secure permanent ground spike, or left flat for you to attach. Plaques will attach to virtually any flat surface. Options include raised or flat bronze images such as bones, flowers or birds. Ceramic photos are a beautiful and individual addition to a memorial. They are very durable and weather resistant. We also offer them individually should you wish to display one on an existing cross or marker in your yard. Unique urns can also be ordered in, as well as crosses and figurines. We are open to all ideas you may have, we encourage you to use your imagination and let the memory of your precious pet guide you. Please email or call us to arrange a time to discuss your ideas and we will do our very best to help you create a unique and everlasting tribute for your pet.